Having the support of family and friends in one’s academic journey is vital, but making sure that one progresses and achieves greater things in life requires self-motivation. 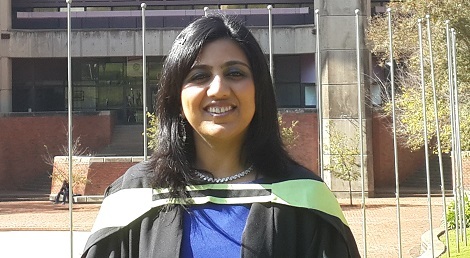 This was Amisha Vanmali’s armour in working to achieve her BCom Finance degree at the University of Johannesburg (UJ) to finally graduate on Friday, 23 May 2014. Vanmali did not stop studying after completing her first degree at UJ; this year she is completing her BCom Honours in Financial Planning. Although Vanmali chose to study financial sciences, she says she is also intrigued by social work because of her spiritual nature. Vanmali completed her primary and secondary schooling at Shree Bharat Shardha Mandir (SBSM) in Lenasia, South of Johannesburg where she grew up. The young hopeful chose to study BCom Finance because she enjoyed doing Accounting in high school. The 23-year-old says her academic journey at UJ was one that taught her discipline and more determination. Although she had a few difficulties she has to fight hard to overcome, she says: “I realised that the mission of achieving the goals I had set for myself was in my hands. Sometimes we just need to push ourselves a little harder than we normally do. That thought changed me to become very independent and disciplined towards my studies and my goals,” says Vanmali. Vanmali was one of the students who had misfortunes during their tertiary academic journey. She was involved in a car accident that set her back in her third year, missing a lot of first semester tests while she was recovering in hospital and at later at home. “At this time, I had a felt hopeless. But with the help and grace of my Guru Pramukh Swami Maharaj and my family’s support, I was able to conquer all hurdles and complete my studies. From my experience I believe that every door is open for an opportunity which can be accomplished in many ways. She is now setting her goals on completing her honours degree and obtaining work experience in her field of study in the near future. “Being a student at UJ gave me a chance to interact with people of different races which made me a better person in many ways. It made me very independent and self-disciplined with great motivation to achieve my goals. The quality of education at UJ is very competitive with other universities and the standard is high and improving all the time,” says Vanmali. Article issued by University of Johannesburg. To view their profile on SAstudy, click here.